This article demonstrates how audio can be played using program in C and C#. Waveform Audio Functions (WAF) can only play waveform (or uncompressed) files. For more information see MSDN. Click Deploy solution in the Build menu to deploy the application. A sample WAV clip will also be deployed along with the executable demo file. Goto My Device > Program Files > vcpp_audio_playback_waf. Double click on the vcpp_audio_playback_waf.exe to run the application. DirectShow libraries can be used to play files with extensions .wav, .mp3, .wma, .ogg etc. For more information see MSDN. Click Deploy solution in the Build menu to deploy the application. A sample MP3 clip will also be deployed along with the executable demo file. Goto My Device > Program Files > vcpp_audio_playback_ds. Double click on the vcpp_audio_playback_ds.exe to run the application. 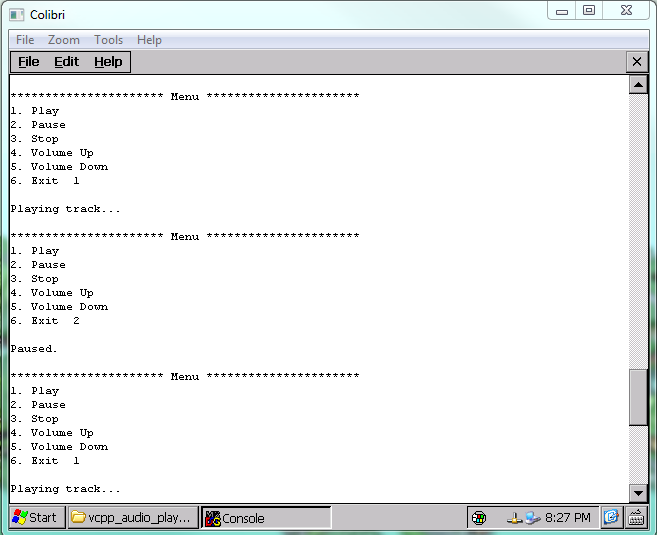 Image shows the output window for both vcpp_audio_playback_waf and vcpp_audio_playback_ds demo applications. Go to My Device > Program Files > vcsharp_audio_playback_demo and run the application vcsharp_audio_playback_demo.exe. Following GUI will open with different controls. 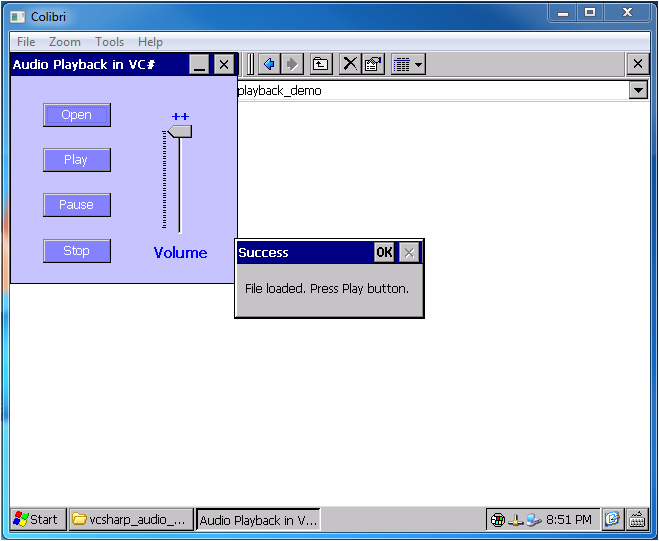 Note: vcsharp_audio_plyback_demo uses DirectShow.net library functions from DirectShowLib-2005.dll from a third party. Microsoft does not provide a managed API for DirectShow. Documentation related to this library and its licence is given here.